Line a large baking sheet with parchment paper, then set nearby. Place popped popcorn in a large mixing bowl, then add M&M’s and pretzels on top. In a microwave-safe mixing bowl, heat the white candy melts per package instructions until smooth. 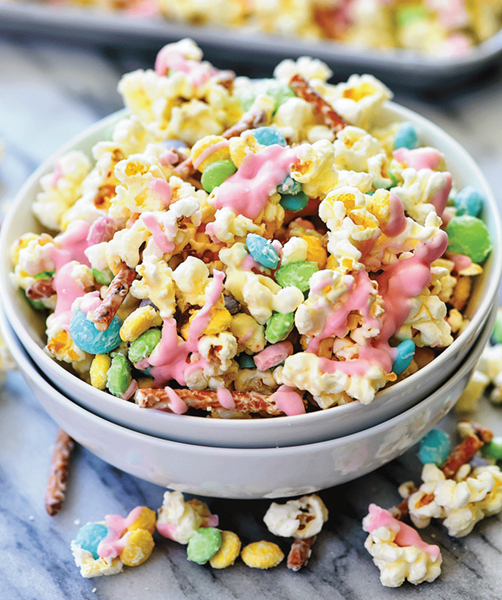 Pour candy melts over the popcorn mixture, then use a spatula to quickly (but gently!) toss and stir until the candy melts have coated all the ingredients. Be careful not to stir too long; you don’t want the candy melts to harden yet. While candy melts are still wet, sprinkle with festive sprinkles as desired. If you would like to add more color, heat some colorful candy melts and drizzle them on top of the bunny bait. Let dry completely (about 1 hour), then use your hands to gently break it apart into snack-sized pieces.